In the early days of squishing pennies, enthusiasts needed to find some railroad tracks and wait for the next train. Today, tourist sites cater to collectors with vending machines that flatten your penny and emboss a variety of images onto it. This process usually cost you 50 cents, plus you have to supply the penny too. One design at the National Building Museum is made especially for the Designing Tomorrow exhibit and another features the Towering Ambition LEGO Exhibit. These souvenirs have been around since the 1893 Columbian Exposition in Chicago. 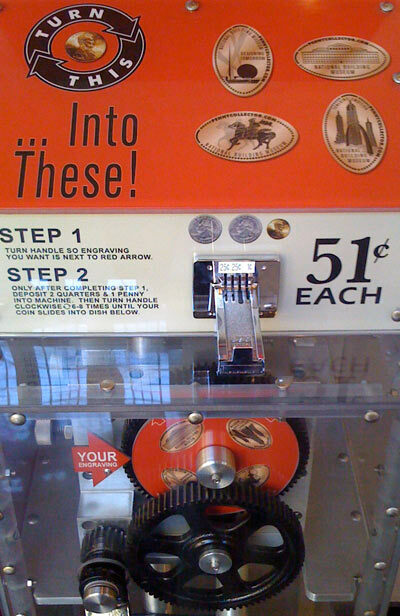 Squished penny or elongated coin machines are found in many tourist destinations. 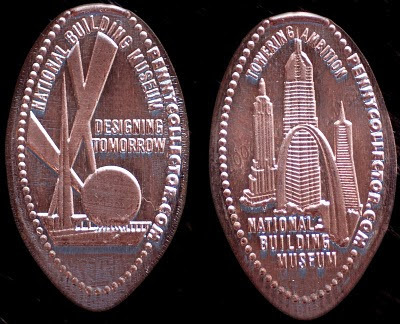 Also referred to as elongated, smashed, pressed or rolled pennies, they are coins that have been rolled in a special machine to create a souvenir. The penny is put through a pair of hardened steel dies, one or both of which is engraved with a design. The penny is squished between these dies, or rollers, with 22 tons of pressure, causing the design to be impressed upon the coin. I have a side collection of squished pennies with architectural themes. As you might guess, there are fans and clubs for collectors of elongated pennies.